Oh love this boho look! The necklaces are gorgeous! Have a great day! Ok you look too adorable! 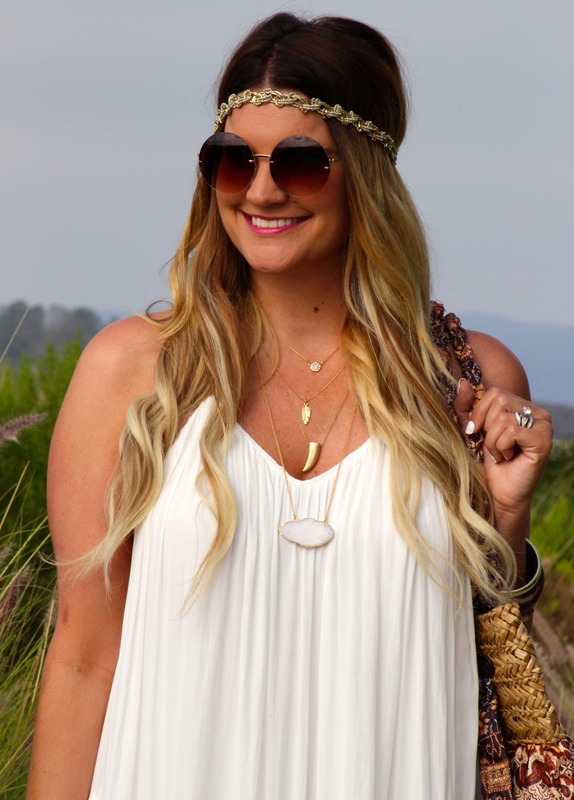 I love this boho vibe and really love your layered necklaces! I don’t even know where to start. You are rocking the boho look! I love it from top to bottom and that bag… Oh, is it amazing! This is such a cute look and perfect for Tahoe. Have so much fun! 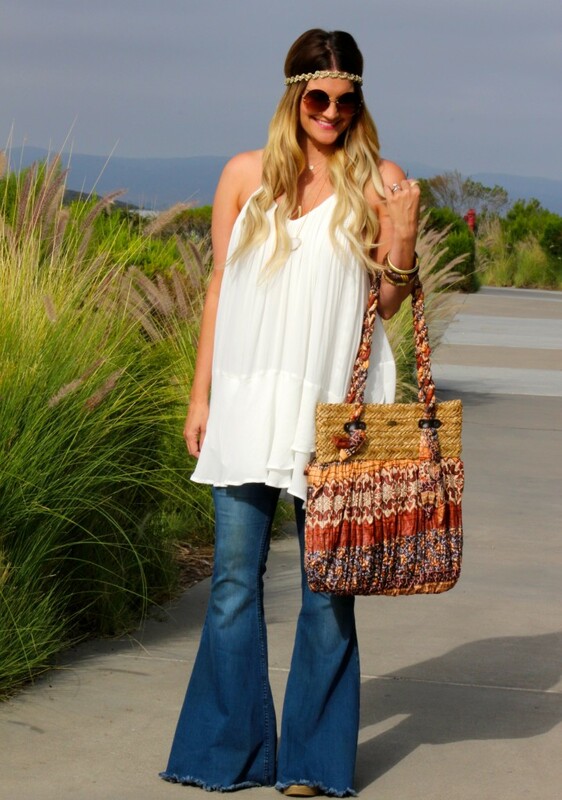 You are rocking this boho look!That dress is fabulous styled with the flares! Perfect boho vibes and summer look. I love the layered necklaces. So pretty! The necklaces and the top/dress are gorgeous! The dress definitely works as a tunic…love it. Ahhh those flared jeans are everything!! Obesssed with this boho look!! Love your Boho look! That “dress” looks perfect as a shirt. Enjoy Tahoe. Love everything about that look! Great 70’s vibe! You look just like Drew Berrymore! Girl, this is beyond adorable! Nobody does BoHo better than you! I am so glad you’re having a fun time in Tahoe, I can’t wait to see all your pictures hope you did a few more outfit posts while you’re there! Have fun beautiful, looking so great! This is boho perfection! I love how you paired the dress with the flares. 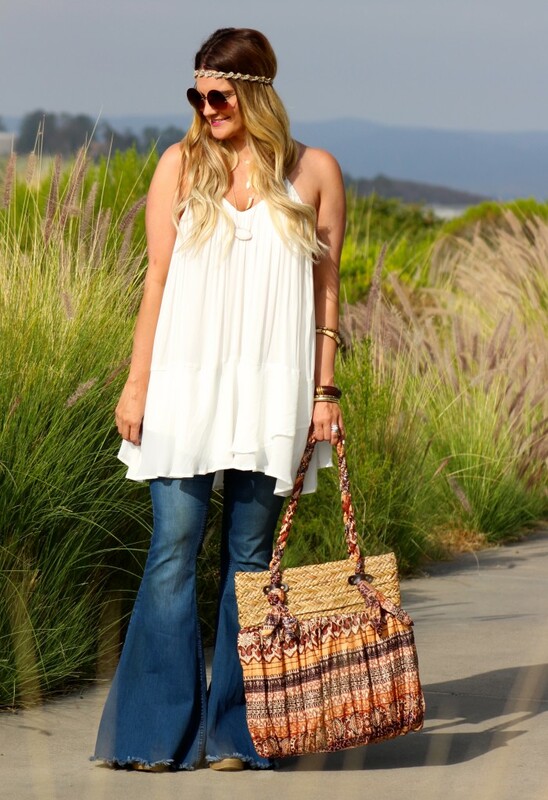 Loving this boho look, those flare jeans are great! Love this boho look, very 70s! You do boho so well! That headband looks great on you and I love your necklace layering! You are a beautiful boho babe in this outfit! I love the shape of this dress and the flair jeans. Love the boho look. Your outfit is stunning. Can’t believe your dress is from F21! Your flares are amazing. I would love to won something from Free People. You look great. Hehe i have that same problem w some dresses–but this literally makes the perfect tunic!! I am obsessed with it paired with those flares!! Love the 70s vibe! So fabulous. I have yet to get back into flares, but I am thinking I may have to take the plunge soon! I love your flared jeans! such a cool outfit! 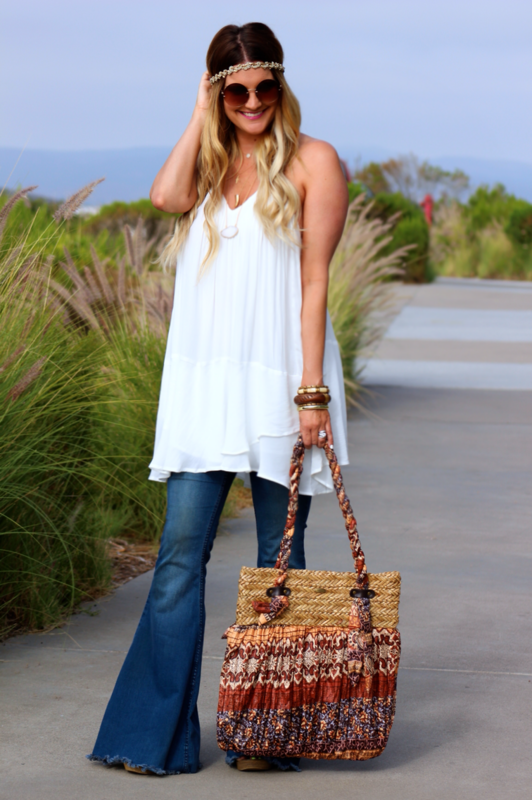 Major boho feels from this post, lady! Love the mega-flares! 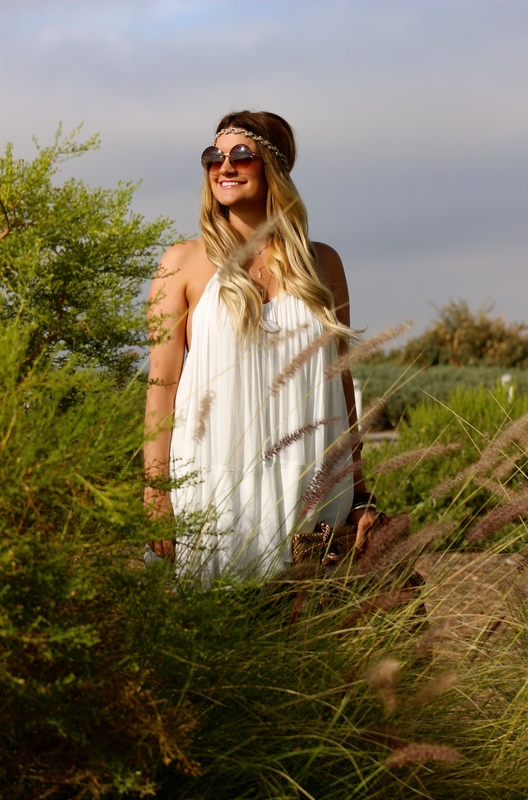 You are totally rocking this boho look! I love the jeans and that headband is so pretty! Since I’m 5’9″ that top definitely wouldn’t work for me as a dress! Haha. I love that you turned it into a shirt instead and made a 70s theme with it. Seriously loving this whole look. Love the 70’s vibe!! You look gorgeous! Major boho vibes and I’m loving it! So gorgeous! Absolutely lovely! Love this boho look. So chic! Pictures are great too! you look so pretty, and again, YOUR HAIR!!!! Love this! Good call wearing that dress as a top 🙂 Love those jeans and your headband! this is the perfect boho look!! I LOVE this look! Your jeans are amazing! I love everything about this outfit! And I find myself doing the same thing as you a lot. Taking what is “supposed” to be a dress and wearing it as a tunic instead! Boho perfection girl!! Love that bag and all of the accessories too! You should have been born in 70’s, you rock this look! I love everything about it, even your layered necklaces. Enjoy the rest of your vacation! The bag is NICE 🙂 Kiss kiss from France, Sand. Your jeans are EVERYTHING!!! Love this look!! love the outfit, cute dress/blouse its actually my favorite piece, the flare jeans looks nice on you, however I’m not sure I’ll be getting into this trend anytime soon. Great look! I love that flares are back and I love how you wore a dress over your jeans!